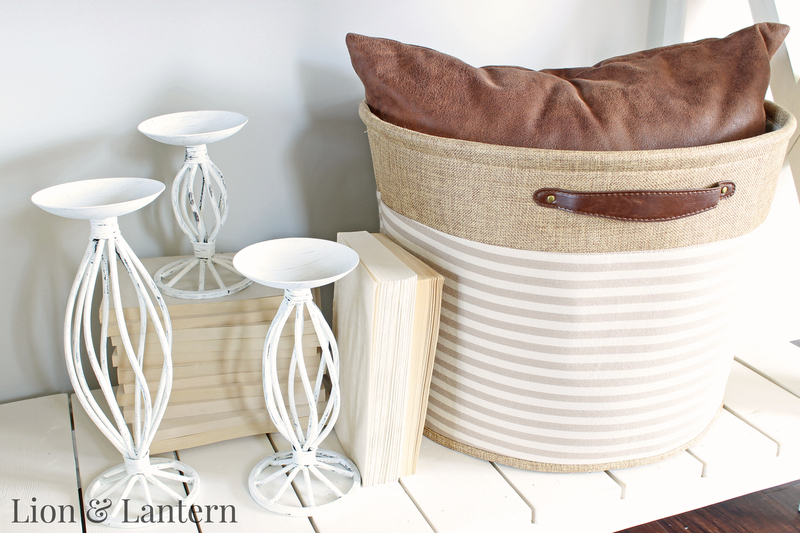 Neutral textures like wood, canvas, linens, stripes, books, painted metals, and greenery make this entryway feel bright and relaxed for summer. Hello again friends! I hope you all had a nice weekend. It’s hard to believe that summer is winding down; in fact, the kids in our town are back to school today! 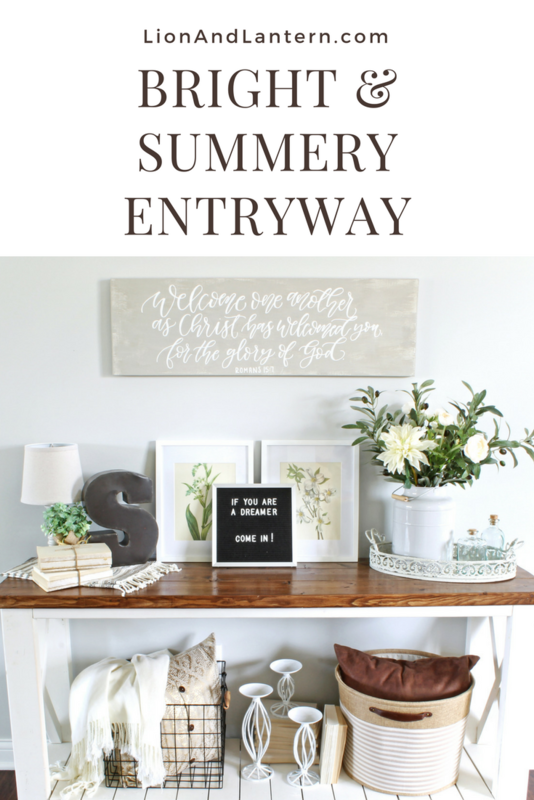 But we do have another month of summer officially, so I’m trying not to break out ALL of the pumpkins just yet 😉 Today I thought I would share our summery entryway decor. 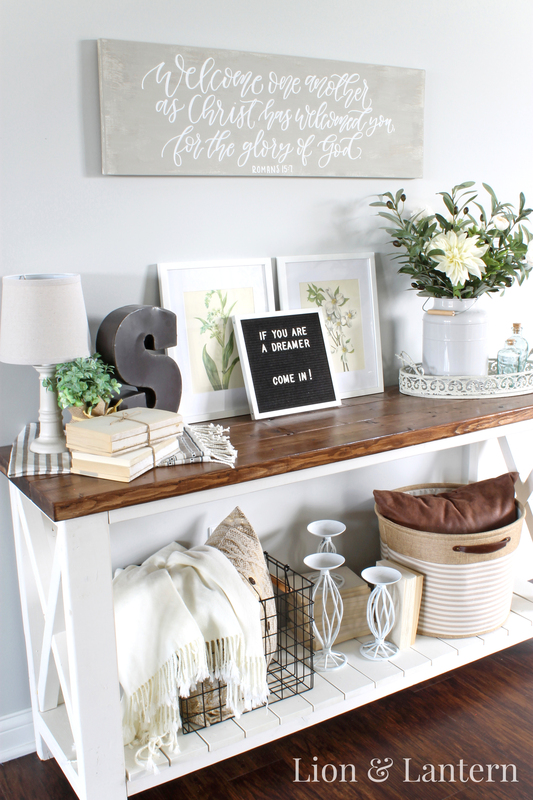 I began daydreaming about our entryway while we were still in the process of building our home last year. We have an open concept floor plan downstairs, but I still wanted the entryway to feel defined and welcoming. I have been experimenting with styling for months, and I’m always tweaking things here, but I love this warm, airy feel for summer! 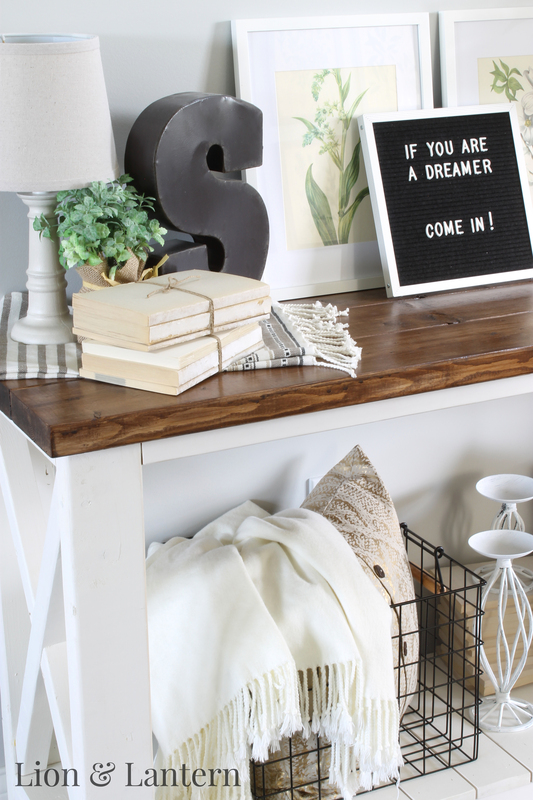 The structure for the space is this gorgeous table that a dear friend built for us, based on the Ana White Rustic X Console Table design. I asked him to omit the center shelf and change the direction of the planks on the bottom. I love the way it turned out, and it’s so special to have a piece built by a friend! When I was first decorating the table, I placed decorative accents all over the top without much thought. While they were all pretty things, it ended up feeling disjointed and messy! After a while I realized that creating smaller vignettes gave a more polished and organized feel, while still allowing me to use a lot of different pieces. 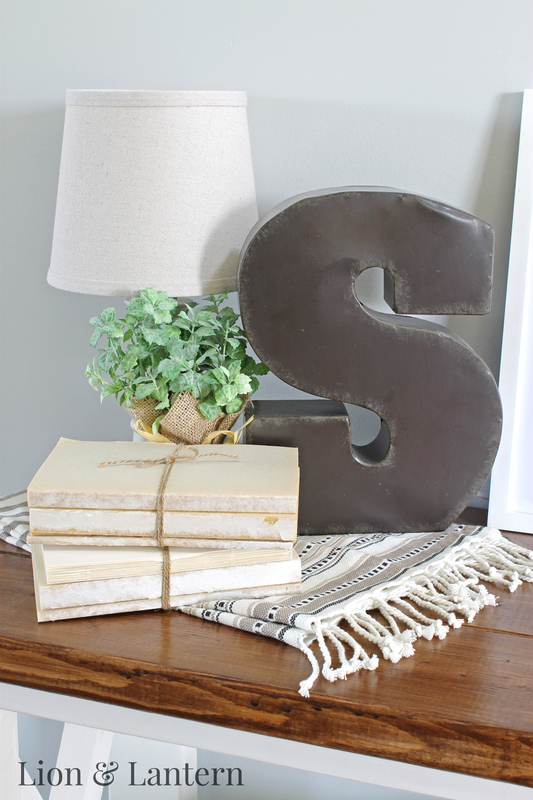 In this corner, I have a small lamp from Walmart, a metal “S” for our last name (a housewarming gift), and some more of the DIY book bundles (update: tutorial here!) I mentioned in my cozy bookcase post. On the other side of the table, I placed a weathered tray from Hobby Lobby’s spring shop, some blue glass apothecary bottles, and a large gray IKEA vase with assorted greenery and white blooms. I love the contrast of the textures: wood, metal, glass, and florals. For the center of the table, I framed two watercolor botanical prints from the book Wild Flowers of America (1968, Crown Publishers, Inc.) that I was able to find used on Amazon for one cent. Yes, $0.01! I believe that will forever be the cheapest decor I own! The felt letter board was a birthday gift from my parents, and while my hubby thinks it belongs at an old movie theater (ha! ), Bug and I love changing the quote every few weeks. 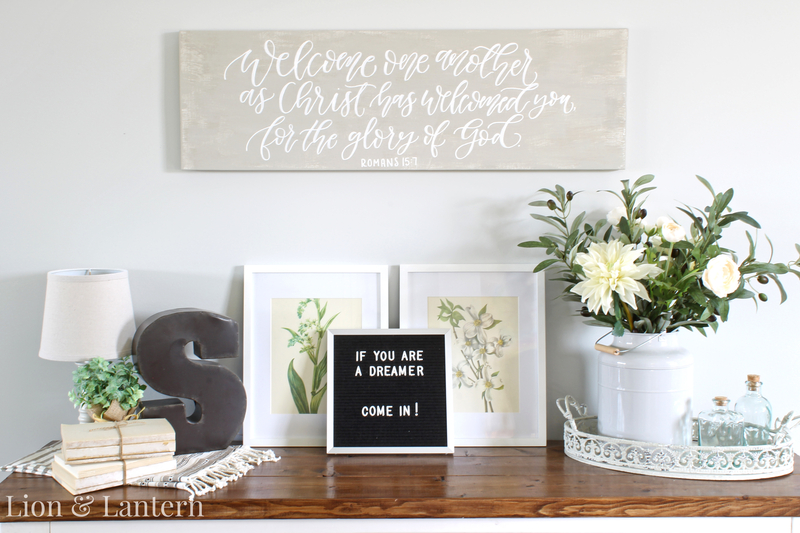 The final piece in our entryway is this wooden calligraphy sign that I painted. I will have to do a tutorial at some point, but I just used pine board from Home Depot (they will cut it for you! 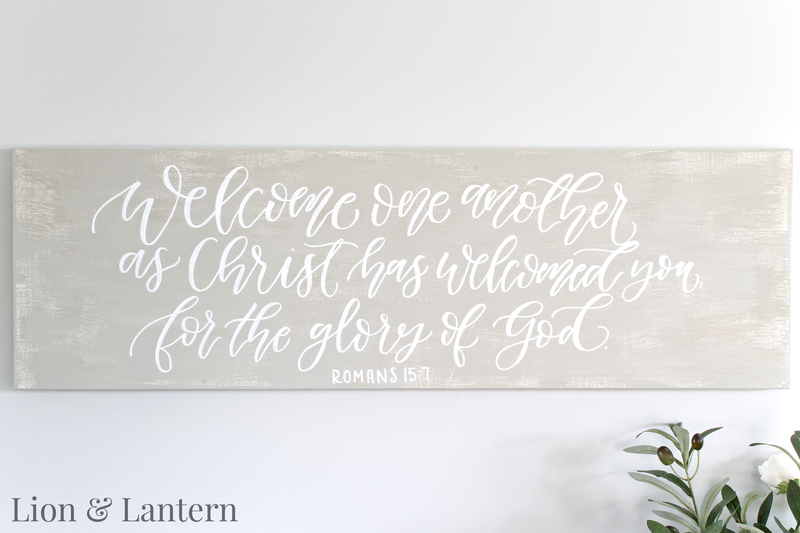 ), sanded it, painted it with chalk paint, and then lettered the Bible verse by hand with a paint pen. Calligraphy is one of my hobbies; I’ve been practicing for about a year and a half, and I love how it combines my loves of creating and words. 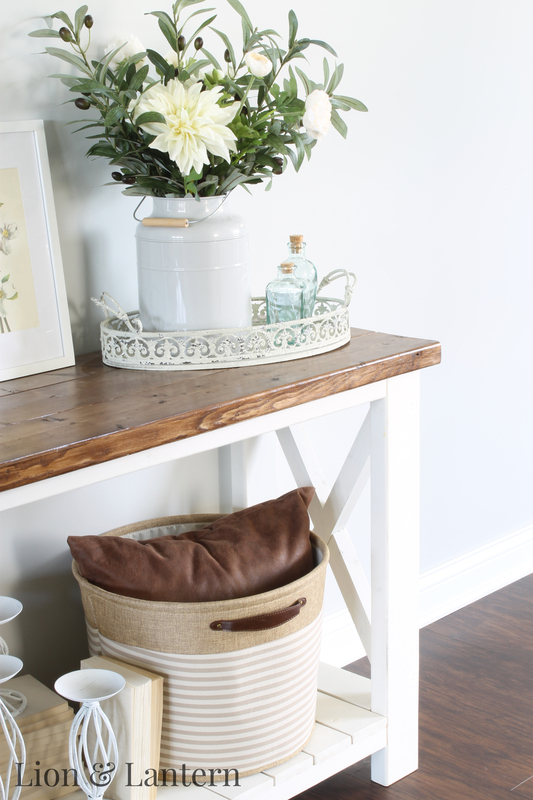 And that is our bright, summery entryway! 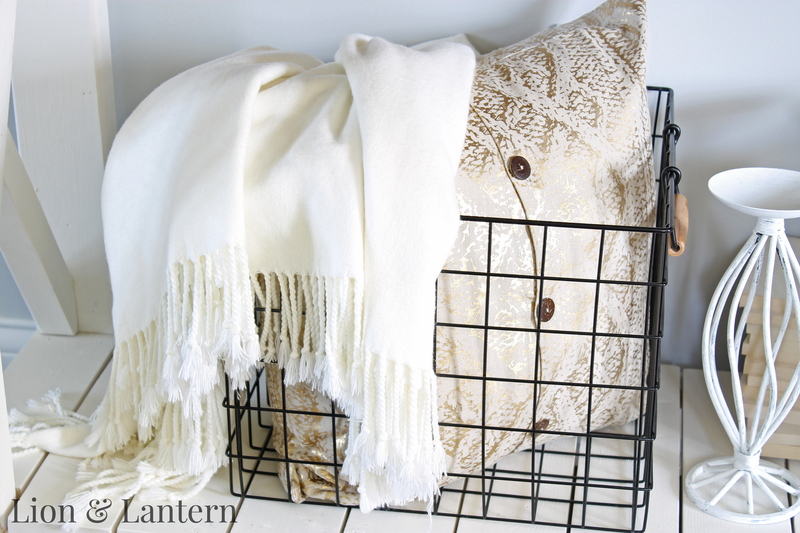 I’m already dreaming up ideas for incorporating autumnal decor, but am going to enjoy this look for a few more weeks 😉 What are your favorite entryway decor pieces? Do you have any special summer plans for the rest of August? Thanks so much for stopping by today, friends. Have a wonderful day! Your entry is lovely. I agree. Smaller grouping lools much tidier. It’s fun to change it around too.